Oh, and what a gorgeous one. God's promise to us. Ah... this is a nice improvement on my Monday. 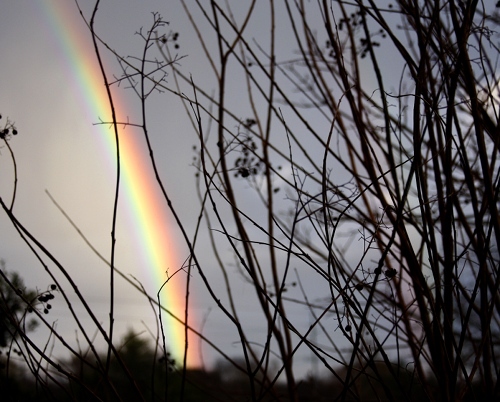 We were blessed with a beautiful rainbow on Sat here in the Low Country;) Your picture is beautiful! Stunning! We only have the rain right now--no blue sky in sight. Wow what a great angle on this shot. What a treat on a Monday! We have lots of rain today here in VA, but so far no rainbows. i've never seen one that vivid. thanks! Was that taken in Nashville this morning? I missed it! What a beautiful reminder from God! I believe in fate - and this post was exactly what I needed today. Thank you! Isn't nature wonderful...this is a great pic...I havn't seen a rainbow in ages...and I live in Blighty!!! ...I can just smell the fresh air! Thank you. there's somethin' magical about them, eh? What a glorious moment to capture!